Forty-five years of paying pension contributions – it now seems they were paid under false pretences. ‘Trudy from Somerset’ looks at the issues behind the pension campaign women born in the 1950s are currently fighting. In the mid-1960s – early 1970s when women born in the 1950s began work and contributing to Graduated Pension and National Insurance the pension age was 60 for women and 65 for men. From 1925 – 1940 women’s pension was equal to men’s at 65, but because women usually married men a few years their senior, it was believed that this was unfair on married men as they had to continue working until their wives reached 65, so in 1940, in fairness to MEN, the government changed the women’s pension age to 60 so the married couple could enjoy their retirement together. The government at the time showed compassion. Nothing has changed, women still usually marry men a few years their senior. Women continued to pay Graduated Pension contributions until it was phased out and merged with National Insurance (NI). Paying National Insurance contributions entitled the contributor to benefits and an old age pension, unconditionally and with no means testing. Women of the 1950s didn’t have the opportunities men had and didn’t enjoy the life-style of womenfolk of today; they didn’t even have equal pay – still don’t but there wasn’t even a law about it then – and they had no choice but to pay their contributions – by law – at the same rate as men. So single women worked their way through life, from the 1960s/1970s making their contributions and with their employers matching these contributions, anything from 9 per cent – 12 per cent of their wages, just like men. They entered into the pension contract in the knowledge they would retire at 60. 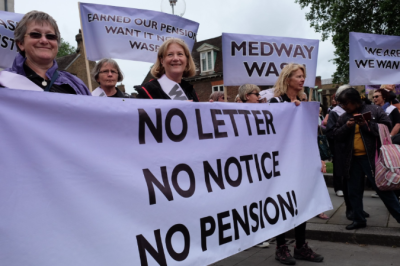 They have paid for their pensions and other benefits as required by law, they were not expecting anyone to pay for them, they have contributed to their pensions for some 45 years and they are still contributing today. Up until the 1970s, married women were given the option of paying the lower ‘married woman’ rate of NI, sometimes referred to as the 2p rate. This was not advantageous to women as paying it meant they would not be entitled to certain benefits and their pension age would be based on when their husband reached retirement. But married women who married before the 1970s who opted to continue paying the ‘standard NI rate’ – the same amount as men – were entitled to all benefits and were entitled to retire at 60 in their own right. Those who married and had children were often frowned upon if they worked; they were expected to stay at home, look after the children and become housewives, looking after their husbands and households. Men were the breadwinners, the wage earners. Mothers tended to find small part-time jobs such as dinner ladies, or cleaners, to fit in around the children’s school hours and holidays, just to add ‘a couple of bob’ to the family purse. Often these jobs were ill or under paid. Women didn’t have the equal pay commission on their side in those days, and there was no national minimum wage, and often these jobs were short on hours and with no tax or NI responsibility. Mothers and carers were covered by the ‘Home Responsibilities’ credits; for example mothers were covered for 16 years while they looked after their children. So, the above are points relating to the history of women’s pensions. That is how things were, the law of the land from 1940: men retired at 65 and their wives and single women retired at 60, in fairness to men. Now let’s look at the present and the future shall we? We now learn that in 1995 the government decided that the retirement ages were unfair to men and needed equalisation, and men and women would retire at the same age, at 65, reverting back to 1925 despite what we learned during the years from 1925-1940 and the resulting change in the law. This was blamed on the EU at the time, and the EU was happy with the relaxed transition during 2010 – 2020. The government is said to have informed all those affected by this change in law personally, as is legally required, but this was not the case. Very few women, if any, actually received any notification of any change. This is being blamed on the fact that the government departments did not have up-to-date contact details for the women involved. But these women still received their NI demands for payment, their self-assessment forms and their child tax credits, child benefits and their working tax credits, so this ‘absence’ of up-to-date contact information is questionable. And so most women were unaware of this change in the law. A change in the law which meant that women born in the 1950s would have to work an EXTRA 5 years. In 2007 the government passed yet another law, again without properly informing women or men, saying that the pension age would increase to 66 between 2024 and 2026. Women all of a sudden would have to work an EXTRA 6 years. Men only had to work an EXTRA 1 year. In 2010 Labour said they would raise the pension age to 66, but not before 2024. Again in 2010 women’s state pension age would now be raised more quickly to reach 65 in 2018 – which would breach the coalition’s agreement promise of ‘no sooner than 2020’. In February 2011: women’s state pension would rise to 65 by 2018 and men’s and women’s pension ages would rise to 66 by April 2020. And this is where women stand at this point in time, while men only have 1 year EXTRA to work and in fairness to men, equalisation, 500,000 women will have to wait longer than a year. In fact 300,000 1950s women have an EXTRA 6 years to wait for our pensions despite the facts pointed out in the issues raised above. So looking at the facts alone it is clear discrimination of women vs men. In fairness to men the law was changed in 1940, and the law was again changed in fairness to men in 1995. Nowhere do I see any fairness to women. All I see is discrimination. Women earning a pittance before the equalisation of wages, and before the introduction of the minimum wage, working and paying contributions towards their pensions – but their pension being denied them at the age they were told they would receive it when they began paying for in the 1960s. After 45 years of paying contributions, these women are still paying for their right to retire at 60 in their own right, some even paying the ‘standard rate’ NI instead of the married women’s rate. They have paid over the top, and they have, it now seems, paid under false pretences. If women are not going to get their pensions at the age agreed when they began paying then the government has no right to collect any further contributions. And it is not the young paying for our pensions and it is wrong for the government to imply this. It is us. We have paid in and we want our entitlement. This is not a benefit. This is something we have paid into all our working lives under the assumption that the government would honour its side of the agreement as we have done, as our employers have done. The government has a duty of care to its people, and just now women are suffering at the hands of government policy. It is also wrong to say the money isn’t there. We all know that the NI pension fund should have been ring-fenced, and that the government have had their fingers in the pot as there is only £30 billion left, but that is enough to begin paying what is due to us 1950s women. And to talk about ‘helping us’! We don’t want ‘help’ – we want what is rightfully ours. We don’t want to talk about ‘deals’, maybe a ‘lower rate, life-time pension to retire early’ with. We don’t want to retire ‘early’. We want to retire at the age agreed upon when we began paying into the system 45 years ago. And a ‘lower life-time’ rate is more discrimination. We have been discriminated against all our working lives. To have to draw a lower rate of pension than our menfolk is utterly wrong when we’ve all paid in the same percentage sum. It is cheaper to pay a woman her pension at the agreed date she began paying her dues, than it is to fund a young unemployed family. Release these jobs for the youngsters, allow us women to retire at the age we agreed upon when we began our journey in our working life of contributions. Look after the women who never stood a chance of accumulating the necessary years of contributions as their caring responsibilities didn’t allow for them to work to claim these credits. The mums who had children were allowed 16 years of home responsibilities credits but this has now changed to just 12 years. Those who are looking after disabled children or elderly parents. Or those who were housewives looking after their husbands and not out working, relying on their husbands NI but who have become widowed. Many women planned their retirement so they could to look after their elderly parents or their grandchildren or volunteer in a charity shop, but this government has stripped the country of its army of grey volunteers in its greed, costing the taxpayer thousands in caring, in childminding. And some of us 60-something ladies have been found to be in need. Some are on workfare, working for jobseekers allowance; some have lost their dignity, lost their will to live as their old bodies are cracking up around them and they can’t cope with the hard graft day in, day out. Some go cap in hand to the jobcentre for benefits, and some go to foodbanks, some have sold their homes. This is degrading when they have done everything required of them all their working lives. This is a serious matter and it needs to be addressed now, not in a few months’ time. We didn’t choose to be born women and I thought discrimination against women had been stamped out, but this government has brought it back on the biggest platform ever. This is an issue which affects every man, woman, child, grandchild, boy, girl, mum, dad, sister, brother, those in need of voluntary services. As Ros Altmann said, we were not given notice of change and have had no time to make changes to our retirement plans. On a personal note, I was going to retire next year at 60 because I have paid the ‘standard rate’ of NI and could retire at 60 in my own right rather than paying the lower ‘married women’s rate’ and wait until my husband reached retirement age. My retirement age would then have been 63 as my first husband was 3 years my senior. Paying the ‘standard rate’ all these years has made no difference to my retirement age whatsoever – I find I have to work until I’m 66 no matter what. But my present situation is slightly different. I was hoping to receive my pension at 60, not long to wait, with my 59th birthday just past. But with the sudden changes in pension ages he will have to continue to work full time until he reaches 66 – or if this fatigue worsens he will have to think about claiming benefits. So after all those years when I paid into a system believing I would retire at 60 now at 59 I find I am not to, and still this government is taking my NI contributions at the ‘standard rate’. I wouldn’t even have been better off had I paid the ‘married women’s rate’ allowing me to retire at 63, the goalposts have changed beyond reach. All those years paying into a system which would look after me and mine in my retirement, and the government has reneged on the deal we signed up to when we 1950s women began our journey into work 40 odd years ago. The government owes us; they are currently in breach of contract. And when we get the matter raised in Parliament, we got told ‘it has been discussed, there is nothing to be done’ or maybe that ‘some idea of help’ should be considered. There is something that can be done, and we don’t want ‘help’. We Paid In, You Pay Out. And we women of the 1950s will continue the fight until we get what is ours by right. As a 62-year-old widow, I endorse everything Trudy says. I am 2 years into ‘extra time’, clinging on by my fingertips. I have a small pension from my husband, which is not enough to live on, I am job-seeking, so far without success, and drawing on my fast-dwindling savings – which were supposed to be there for some comforts in old age. And I have another 3 and a half years to go before I reach my twice-deferred pension age. This situation is hugely discriminatory towards women. Our pension age should not have been equalised with men’s until we were truly equal with them, i.e. earning the same amount. We learned recently that working mothers today still earn 33% less than men – and that’s an improvement on the situation that prevailed when we 1950s women began work. There is no mention here of those born between 1950 and 1953. Admittedly, we are now receiving our pension, but we were still robbed of our pension on a graduated scale (as explained to me by a rude lady in the DWP when I asked why) I my case 18 months worth of pension. We received NO indication, letter or notification until we applied for our forecast. There is no mention of the fact that there was no such thing as child care vouchers, working tax credits, council tax rebates or housing benefits available to women in those years. I fully support the right of all those who are, or will experience, grand theft by the government think we really do need to band together to win this case!!!! I was born October ’53, my friemd, May ’53. She has been in receipt of her pension since last November while I must wait till next March, 18 months later. Makes no sense to me. So sad that we must endure this injustice. I was born in March 1954, I get my state pension aged 65 and 5 months. My best friend born August gets hers aged 65 and 10 months?!?!? Our other classmates born November + December 1953 get theirs at exactly aged 65. How is this fair??? I was born December 1953. I don’t get my pension until March 2019, aged 65yrs 3months old. My colleague born January 1953 received her full pension plus heating allowance plus Bus Pass in November 2015. The 11 months age difference equates to 3yrs 3 months State Pension difference. I received a letter (Feb 2012) exactly 1yr 10months before my 60th birthday – SPA rise 5yrs 3mths. Husband received same letter giving 7yrs 5mths notice of a 4mths SPA rise. Equality? I don’t think so. I was born on 6th April 1954, so lost a further year by 1 day. I will be 66 and 7 months when I receive my pension. I was widowed 18 months ago, got a bereavement allowance for 12 months even though my husband didn’t live long enough to claim any pension. I am also helping to support a disabled daughter. If one more person tells me “You wanted equality” I will scream. You should get your pension at 65 yrs 7 months. I was born 13/05/54 and I get mine age 65yrs 7months and 24 days. I also am a 62 year old woman I have health problems they stopped my money 3 years ago now , so my husband has to keep me feed me clothe me . It’s a good job my husband is ten years older than myself . I have worked all those years yes I do agree fully the government took our money so the should pay out . A very true and eloquently written article by Trudy. I am one of the 300,000 women who now have to wait until I am 66 to receive my pension. My husband is 5 years older than me, had a stroke in 2009, my parents are in their 80’s and need daily help, so they suffer because I can’t retire for another 6 years. No one thought of the full consequences of this injustice. Deplorable! There is enough money in the NI Fund surplus, above that required for contingencies, to refund the second increase so unfairly imposed in 2011 according to information in an article by money expert Steve Lewis in the March edition of Saga magazine. I still don’t understand why this isn’t being challenged in court? Thank you for the historical information… that is indeed enlightening. I totally agree with this fight for what is truly a breach of contact by the government. If a private insurance company decided to change the maturity date of any policy after it was sold with advertised benefits then they would be guilty of mis-selling and forced to compensate by the Financial Ombudsman….so why should this be any different because it’s a government?! I also go back to the point on the reduced NI contributions paid by married women, who were promised their pension would be paid based on their husband’s contributions. I was one of those women, my husband died when he was very young (47) and I remarried some years later. When I enquired about my pension as I approached 60 I was told that my first husband’s contributions ceased to apply to me when I remarried and the contributions my first husband paid in had “just gone back into the pot” ! He never lived long enough to claim his pension and so that money was “nabbed” as a small windfall for the government. I was never advised that by remarrying I would lose those years contributions from my pension. I now receive a reduced pension because of this, so the government win again! I received my reduced pension when I was 63 years and 7 months old, so I believe I’m owed those missing months, totalling around £10,000. I too am one of the 300,000 women who have to wait until 66 to retire. I am ‘lucky’ because I still have paid work, but I don’t know if I can keep this up for another three and a half years. My husband is 70 and we feel we are losing out on the time we had planned to be together at the end of our lives. The article doesn’t mention the fact that part time workers were not allowed to contribute to occupational pensions until relatively recently (more discrimination which affected mostly women). I spent most of my life working part time to allow for childcare etc. and this has reduced my ability to accumulate a decent occupational pension. I understand that money is tight, but this policy is not helping the old or the young. It’s time for the government to admit they got it wrong and start paying out these pensions. It’s a horrendous situation, and one that’s likely to get worse for our children who will be unable to retire until even later, probably over 70! And the way things are going it’s likely they won’t have muchbofcaxstate pension at all, meaning those without property (the vast majority of under 40s) may not be able to retire at all. At least we get to retire m! Something needs to be done about the whole system! I had my 60th birthday this week. No pension for 6 years. I worked and brought up my 3 children on my own. No private pension. No chance to save. Made redundant aged58. Now I have arthritis, fibromyalgia and migraine headaches and suffer anxiety and depression. I am claiming ESA but am dreading the work assessments. I claimed PIP but was told I look young for my age. This was refused so am facing ongoing battle to get £73.10 per week to live on keep house food and bills paid for 6 Years. How is that possible? I think this government are discriminating against women the disabled, the I’ll anyone they can bully and rob. They are disgusting. They paid the bankers 390 billions and since then the bankers bonuses have been£290 billions. We are paying with our credits. How do they sleep at night? Can I ask why women born in 1960 and 1961 are not mentioned. I was born in 1961 and my retirement age is 67 so 7 YEARS added to my promised retirement age of 60. I don’t understand why campaigns always mention women born in the 1950s when I have suffered a larger increase (again overnight with no notification). I totally support and want to join in the campaigns but strictly speaking are excluded! I am 64 years young this year never had notification I was not getting my pension at 60 can I become a member as we should all be getting the money we paid in in my case from the age of fifteen. What can I do?? Thank you for this great summary of discrimination upon discrimination. When I was 50, I was 10 years from retirement. When I was 51, I was 10 years from retirement. And the next year, and the next and the next two. For six years, I was always 10 years from retirement. To add insult to injury, the government has stolen £50,000 from me – six years’ worth of the state pension at £159.55 a week. It was my entitlement. And the pensions minister? What does he retire on? and when? The architect of the increased state pension age, Sir Robert Devereux, is retiring at age 61, with a pension pot of £1.8 million. That is the £50k or so of a lot of people like me. Hi Everyone! Here is your reminder to send a Christmas card to Philip Hammond and Guy Opperman. Please post on Friday 30th November or Saturday 1st December. Put in what you like, glitter, white feathers etc, but let them know you want your pensions and we are never giving up.